You have selected the perfect material for new kitchen countertops as part of your home renovation project. So, what's next? Installation. 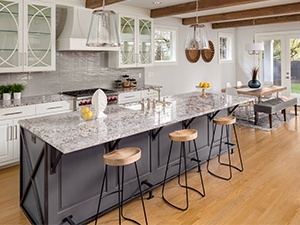 This article will guide you through the steps you can take to help us provide a seamless countertop installation experience for you. First, it's important to make a clear path from the work truck to the work area, removing any loose items or debris outside the home and any furniture or breakables inside. If it’s winter, make sure the path is free of snow and ice. If we are tearing out your old tops, be sure to remove any items on the tops. This gives us more elbow room to work on your project, and it keeps your things from getting dusty. We love kids and pets! However, two or more installers will be moving very heavy stone slabs and making quite a bit of noise for several hours or more. If you have children or pets, you'll need to secure them away from the project for their safety. We're glad that you are excited about your new countertops. However, we would prefer to work uninterrupted so that the installation process is efficient. Once the work is complete, you will have the opportunity to admire your new tops and ask questions. Twenty-four hours after the countertop installation is complete, the backsplash can be installed, and water and electricity can be reconnected. Plumbers, electricians, and tile installers do not accompany our countertop installation crew. Make sure you leave the sink base cabinet and other areas clear until these folks complete their work. Once everything is done, some dust may settle, so plan to give your kitchen a good cleaning. Countertop installation requires some preparedness, but the time and effort are well worth the reward! Feel free to contact us with any questions or concerns you may have about your countertop installation.